First hike of the season on Sunday. Weather was gorgeous. Got started on the trail at 9:43 am and it was already warming up nicely. Blue skies, bright sun, and not a single cloud. Temps started out in the low-mid 40s, but were into the mid 60s by the end of the day. I had originally planned only around 15 miles, but ended up doing a bit more. 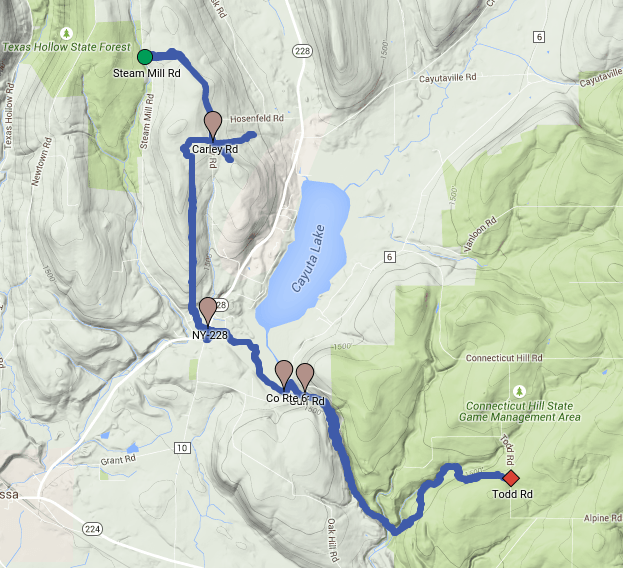 This hike I headed east from Steam Mill Rd (M15) to Todd Rd (M16) and back. Part was due to a wrong turn off Carley Road (you’ll notice the big “jog” on the track). I hadn’t looked at the directions or map and saw a power line cut and snowmobile trail go off to the left of the road and blindly followed it out across a large field. Had I looked to my right I would have seen the white FLT blazes going up a hedgerow of trees. I wandered around for a little while trying to find the trail and eventually looked at the map and mentally kicked myself. On the upside I did get a good picture from up in the field looking back towards a farm. I started off heading up Carley Road. It was still crisp out and I was wearing a long-sleeved shirt and jeans; that would change by the end of the day. Along the road I saw small melting piles of old snow. 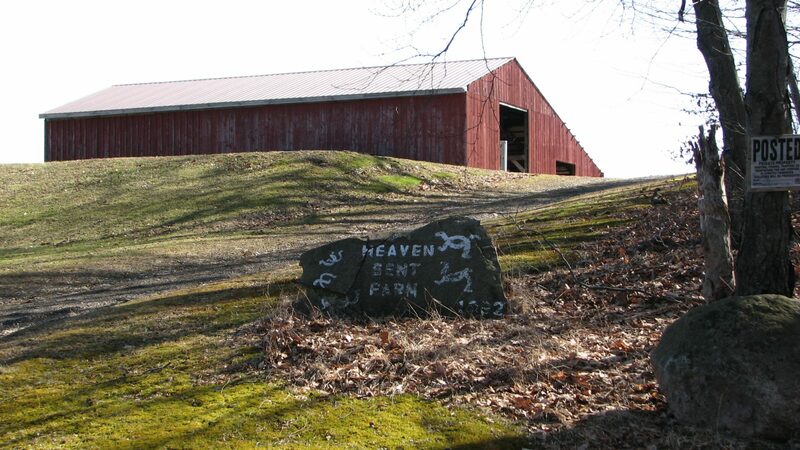 Near the top of the climb up Carley Road the road turned to the right and at the corner was a barn and a large rock that someone had painted the name on: Heaven Sent Farm. A little further on I passed though a wooded section of the road that opened up to fields on both sides. There were still piles of snow here and I could imagine how high they must have been in the middle of winter. The road continued a small climb winding between the fields and finally opened up to an amazing view of the valley. I continued down the road and up the other side to a power line right-of-way (mile 1.2 – 10:09 am), and here is where I made my mistake. 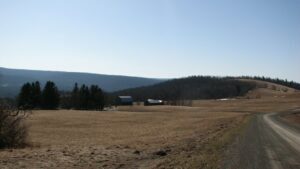 I blindly assumed that the trail would turn left and follow the power lines across the field – I had hiked other sections of the FLT that did exactly that. So I started across the field expecting to see the white blaze of the main trail once I reached the hedge row of trees. I got there and did not find a blaze, but I did find another amazing view. I took a photo and turned and followed the edge of the treeline hoping to find a blaze. After reaching the bottom of the field and still not finding a blaze I realized I had made a wrong turn and decided to head back to the road. I checked the FLT map that I had downloaded on to my phone and quickly saw my mistake. Once I made it back to the road it was obvious that the trail turned right instead of left, the blazes were clearly visible along the treeline. Happy to be back on the trail I followed the blazes up a dirt road along the treeline. The road continued on up to some shacks that were used during the winter for providing food and drinks to snowmobilers. I could imagine people flying along the fields and pulling up to these rest stops to grab hot coffee or hot chocolate and a snack. 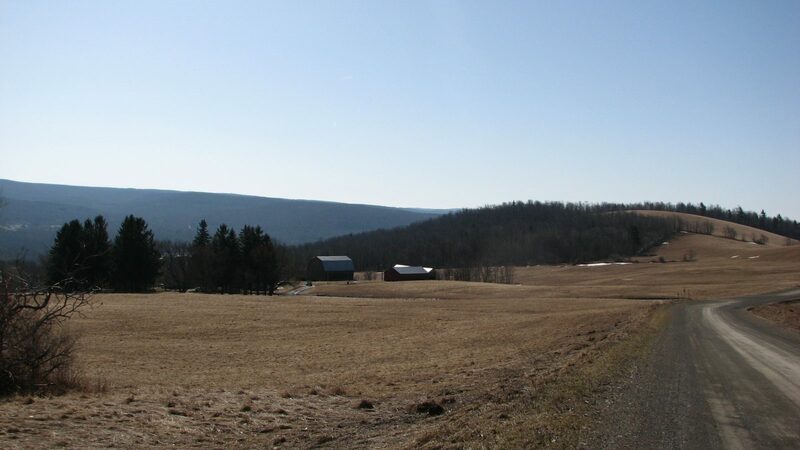 The road turned to the left and wound its way through some trees and passed by a small pond and Rogers Hill lean-to (mile 2.55 – 10:47 am). The pond still had a skim of ice covering it. The trail continued on past the pond and then took a left towards the open fields and the right to continue along a treeline. It still followed a dirt road which made for easy walking. Eventually the fields fell away and the road continued on into the trees. At this point it was more suitable for 4-wheelers than for cars, but was still easy to walk. A few large puddles did mean some dodging around, but overall a nice walk. The trail had been descending from Rogers Hill lean-to over for over a mile, but now it started a steeper descent, 280 feet over 1/2 mile (from Rogers Hill lean-to the total descent was around 500 feet over 1.6 miles). I soon heard people and saw some houses. It descended down through some trees and came out on to Shady Lane (mile 4.1 – 11:21 am). I saw that someone had made a smiley face out of one of the FLT blazes and took a picture. 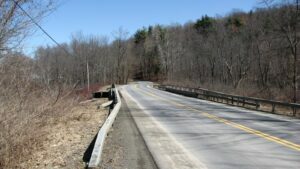 Shady Lane ended at NY 228, which was a well paved, two-lane road with a double-yellow line down the middle. I had to wait for a few cars to pass before I could cross. 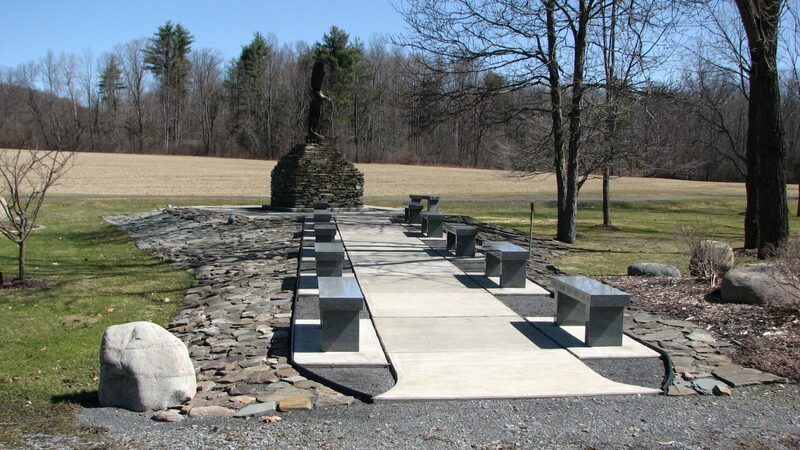 After crossing NY 228 I found the Schuyler County Veterans Memorial Park (mile 4.2 – 11:24 am). I spent some time walking through the very nice memorial and reading the signs and names of those who had made such great sacrifice for our country. It was a humbling place to be in; I have great respect for the veterans of our country. After leaving the memorial park I continued along a dirt road for a little ways and then turned off and headed into the woods. The trail came out on to another well paved, two-lane road: NY 6 (mile 5.25 – 11:49 am). I had a short walk along the road to cross over Cayuta Creek. After crossing the bridge I turned right off NY 6 onto another dirt road, Gulf Rd. A short walk down Gulf Rd and the trail left the road and continued along a path that followed Cayuta Creek (mile 5.45 – 11:56 am). Here I met another hiker and her dog. She was waiting for a friend who would be joining her soon. She told me she had hiked here over the winter and that there had been some avalanches down the trail. I did find several places where snow was still covering the trail and it was clear there had been an avalanche. I also passed several little water falls along the trail too. 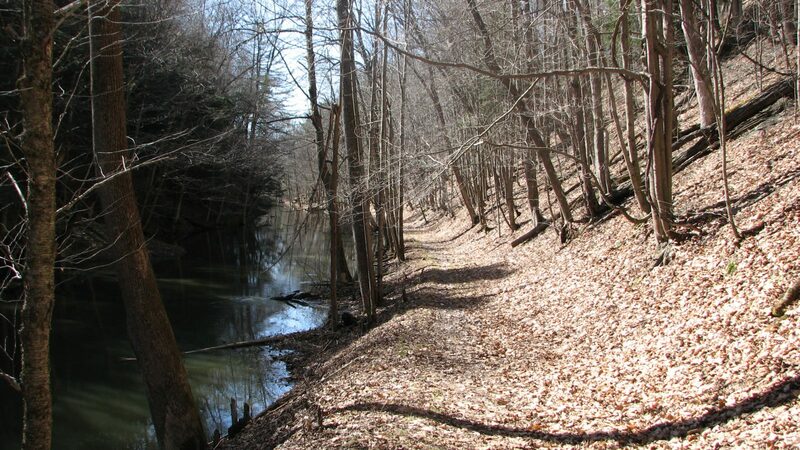 The trail was nice and smooth and an easy walk for quite a way as it followed the creek and I passed several people out enjoying the beautiful warm spring weather. 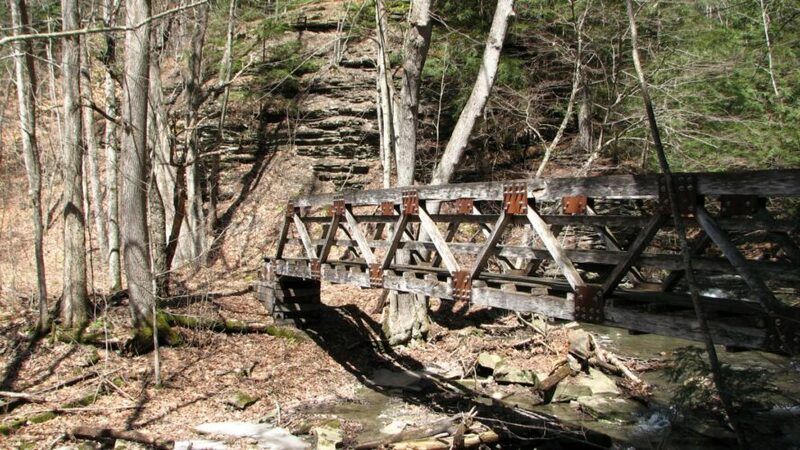 Then the trail began to turn away from the creek and crossed the first of two bridges (mile 7.0 – 12:37 pm). After crossing the second bridge (mile 7.1 – 12:42 pm) the trail turned left to head up the hill and was not as well-traveled or as smooth. The trailed climbed about 200 feet in 1/4 mile here before dropping back down and then climbing again for about 250 feet over 1/2 mile on its way up to Todd Rd. 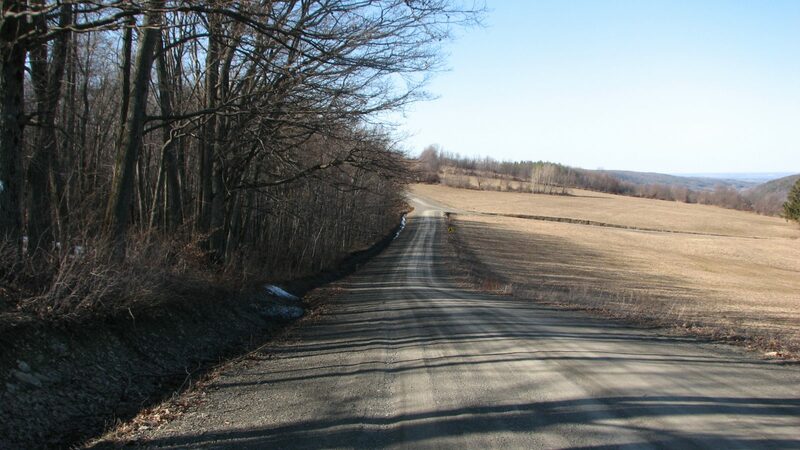 I reached Todd Road, which is just a small seasonal use road (mile 8.75 – 1:37 pm). I had attempted to start from Todd Rd last October and had nearly gotten my car stuck. I did make it to the trailhead only to find I had forgotten to pack my boots and was forced to head home and abort the hike. After reaching Todd Road I took some photos and turned back. 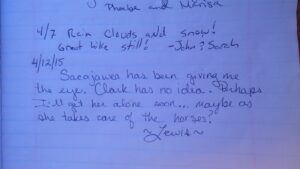 There was a trail register nearby and I signed in as I usually do. I noticed another sign-in that made me chuckle. 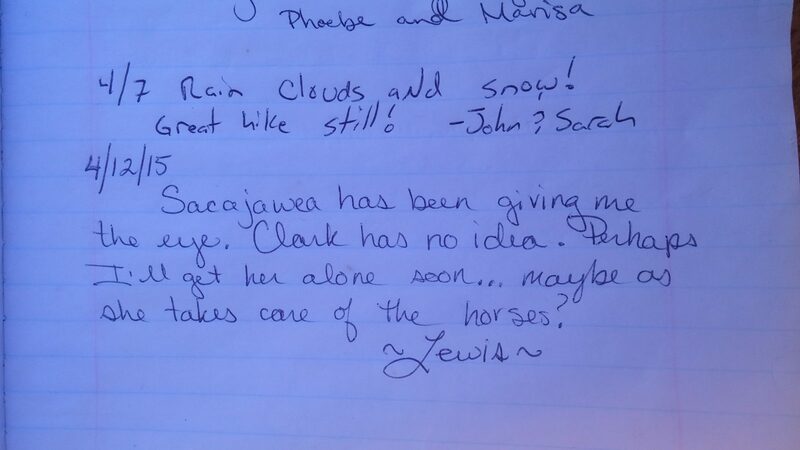 Someone had gotten creative and wrote as if he were Lewis of Lewis and Clark. I had passed a nice spot on my way to Todd Road that I planned to use as a lunch stop just a short distance away. I happily stopped and dropped my pack. The first order of business was to take care of my feet. I had been feeling some “hot spots” on my heels since I had crossed the bridges and I found I had gotten some blisters on both heels after taking my boots off. I bandaged the blisters and put some moleskin over the bandage and finally wrapped it all with some athletic wrap to keep everything in place. I also took the opportunity to change into shorts and take off my long-sleeved shirt. Then I settled down to enjoy my lunch. After resting for a while I reluctantly put my boots back on and started the trek back to my car, it was now nearly 2 pm. 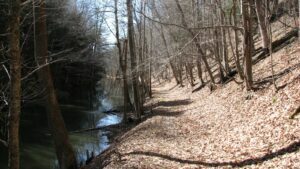 I continued down to the bridges and crossed over them and back on to the trail along Cayuta Creek. 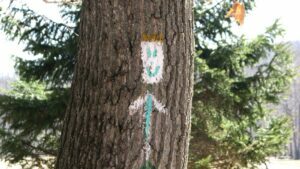 As I was walking along the trail I saw a couple in front of me, probably in their twenties. The man had a big “lumberjack” beard and the woman had long waist-length brown hair. She had pulled two parts over her shoulders to hang down the front and the rest was down her back. The man was walking about twenty or thirty feet in front of her. I thought that her shirt looked rather odd. As I drew closer to them I realized why i thought her shirt looked odd, she wasn’t wearing one! I said hello to them – what else do you say? 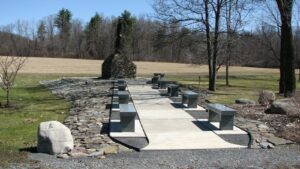 I was soon back at NY 6 (mile 13.4 – 3:48 pm) and heading back towards the Veterans Memorial Park. 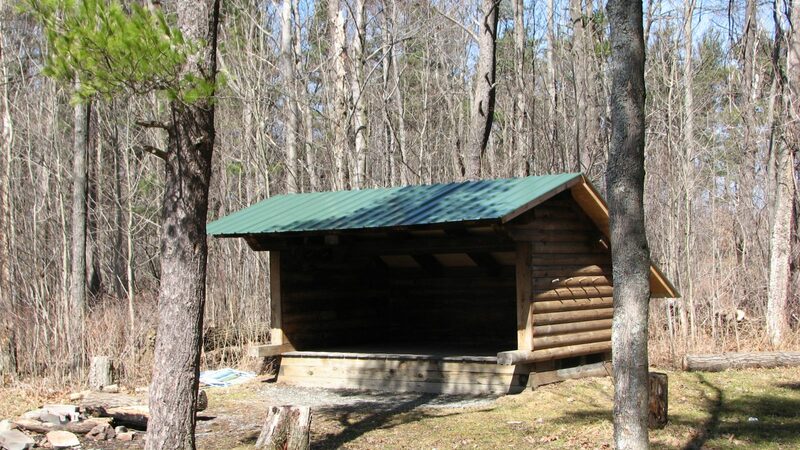 On reaching the park I veered off to sit down and rest at the picnic shelter area (mile 14.5 – 4:12 pm). My feet were better with the bandages, but the damage had been done and I was hurting a little. I knew that I would have a climb ahead of me to get back up to Rogers Hill lean-to also. I started out again and headed up the steep climb. I passed a group of people in a large 4-wheeler coming down the road. Soon after I saw two young boys on 4-wheelers as well, one of them seemed to be having a problem and soon the large group rejoined them and helped. I said hello and continue my slog up the trail. 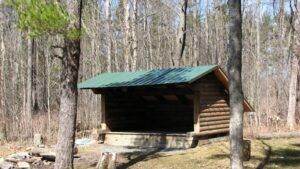 I stopped at the Rogers Hill lean-to for another rest before moving on again. I took some more photos at the top of the hill, it was sunny and clear and offered some great views (mile: 16.6 – 5:17 pm) . I was almost back to my car now. I turned on to Carley Rd and headed down along the treeline (mile 16.7 – 5:23 pm). The road rose back up again and wound around. I paused briefly to look back and take one more picture of the valley. I crested Carley Rd and headed down past “Heaven Sent Farm” and towards my car. As I got further down the road I could see the car in the distance. I was happy to see it and glad to make it back. I took off my pack, gently removed my boots, but left the moleskin and bandages on and changed into my sandals and a clean shirt. It was 5:47 pm and I had hiked 18.3 miles, more miles than I planned, but it was a good hike even though I ended up with blisters and a little sunburn.